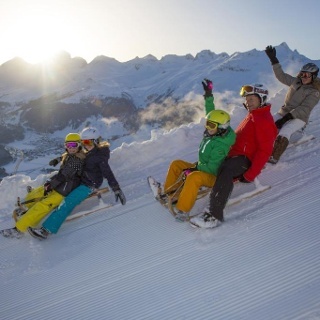 Travel on world-famous railway tracks to a unique sensation on toboggan runners, starting off slowly in the little town of Preda and then followed by a rapid and winding descent under viaducts and along the Alvra and ending up gently in Bergün. First, the Rhaetian Railway train twists its way through loop tunnels and over viaducts on its upward journey. The journey is simply stunning and quite breathtaking – not least because it is on a route that legends are made of and one which has been a UNESCO World Heritage site since 2008. From the train you can see the tobogganers making their way down into the valley. 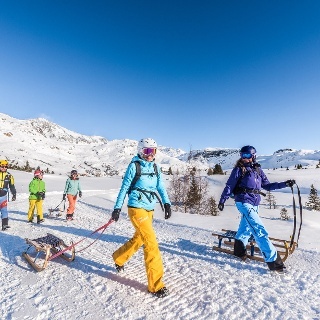 Starting 1,800 metres above sea level in Preda, this route takes you 400 altitude metres downhill to Bergün – a tobogganing experience you will not forget in a hurry. The route winds its way with great views of the Maiensäss settlement of Naz and the surrounding mountains. It wends its way under the viaducts and through the winter landscape towards Bergün, where the route slowly flattens out. This route runs along a closed pass road with an even gradient that makes it ideal for tobogganing. 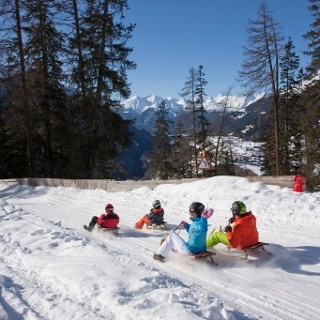 As the longest illuminated toboggan run in Europe, it is also suitable for families with children, but caution is advised at the curves. The sledging run is illuminated at night from Tuesday to Sunday - a special experience for everyone! For safety reasons it is recomended to wear a helmet. Please notice, that toddlers ride accompanied by an adult. Important: Plastic bobsleighs with mechanical brakes and dogs are forbidden on the track. By train to Preda. There are trains every half hour to Preda. By car to Bergün and from there take the train to Preda. At the entrance of the village there is a large parking lot. The day ticket costs CHF 5.00.